Scale: Available in 1/72 and 1/48 scale. Contents and Media: 1 small sheet of decals, 1 sheet of artwork. 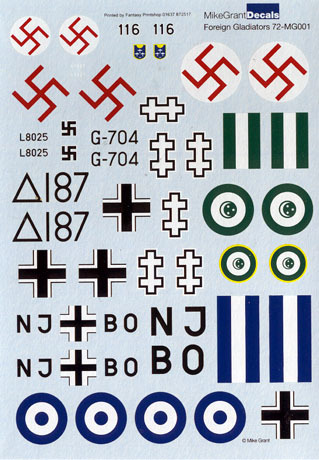 Mike Grant Decals produce limited-run markings that might otherwise never be released. Gladiator Mk. II, Egyptian Air Force, finished in Dark Earth and Light Earth. Gladiator Mk. I, Luftwaffe, in overall RLM 02 Grey. Gladiator Mk. I, Lithuanian Air Force, overall aluminium dope with green upper wings and light blue under the fuselage and the lower side of flying surfaces. Gladiator Mk. 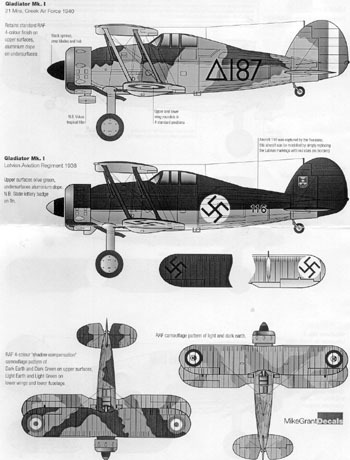 I, Greek Air Force, standard RAF Four-colour finish on upper surfaces, aluminium dope on lower surfaces. Gladiator Mk. I, Latvian Aviation Regiment, upper surface olive green, lower surfaces aluminium dope. The decals are all crisply printed and in perfect register. The instructions are supplied on both sides of a single sheet. The instructions are in black and white, but a full colour version may be viewed by following this link. Although Mike Grant Decals are usually printed on an ALPS printer with carrier film covering the entire sheet, these are a limited-run screen printed production. Carrier film is minimal, the colours are well saturated and the registration is perfect. These screen-printed markings will be less susceptible to damage than ALPS decals too.